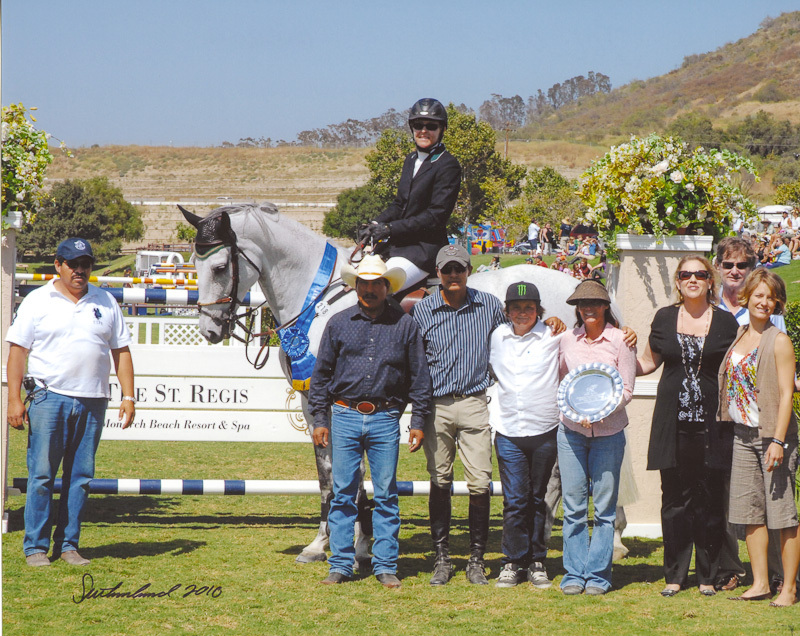 Congratulation to Michelle Parker and Socrates de Midos on their victory in the $25,000 Red White & Blue Festival Grand Prix at the Mission Viejo Riding Park in San Juan Capistrano. The Alvarado brothers, Alex & Sal, discovered the big grey gelding on a horse buying trip to Europe late in 2008 and are proud of his show ring prowess with Michelle. Since his arrival in the U.S. he has already garnered three grand prix wins and multiple placements. Pictured above in addition to Michelle Parker aboard Socrates are the members of her team: Salvador Alvarado of Rancho Las Tres Cruces (left), Armando Salazar, Alejandro Alvarado (also of Las Tres Cruces), Albert Pinella and the awards presentation staff of the Red White & Blue Festival.